Don’t miss the latest coupon and promo code, available for this week at JOANN Fabric stores or online. 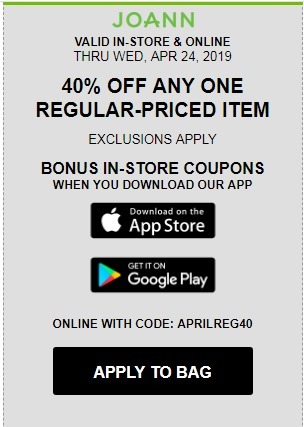 Find the JOANN Coupon – 40% Off Any One Regular-Priced Item – valid through Wednesday, April 24, 2019. Joann offers teachers 15% discount and a 10% discount to members in the military, students 14 and up, interior design professionals, members of craft and sewing organizations with proof of membership or certification. Discount includes regular, sale and clearance items and can be accessed every day for merchandise storewide.